To own a coffee machine is almost every coffee drinkers dream. Not only they can serve your coffee faster, they also made to optimize your coffee taste nearing those you usually get in coffee shops. 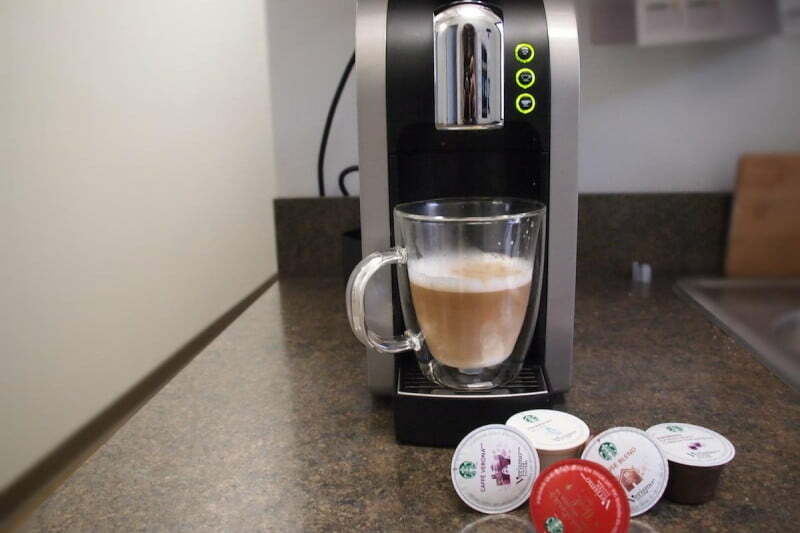 Among those available, we are going to introduce you to Keurig Rivo and Starbucks Verismo. These machine is very popular among coffee drinkers and you may interested on them too. Keurig Rivo is an espresso machine from the famous American home brewing machines makers Keurig. This company offers machine for both home use and commercial use and based on Waterbury, Vermont. With Keurig Rivo you can make your favorite coffee whether it is espresso, cappuccino or other coffee and milk based beverages. For those who are reluctant to spend much more on espresso machines, this brewer is perfect for you. With a price that is not too expensive, you already able to make your espresso at home. Owning Keurig Rivo will also saves your money in a long term, since you don’t have to spend more on coffee from coffee shops every now and then. Using the machine is a breeze and almost anyone can use it just right away. The machine claims it can brew an authentic Italian Espresso under minute, taken from Keurig site, the machine was named after Italian word for revolutionary. Keurig Rivo comes with 15 bars pressure to make sure that your ground is extract fully to makes the best taste comes out of it. 15 bars is impressive, since not many machines in its class comes with the same power. 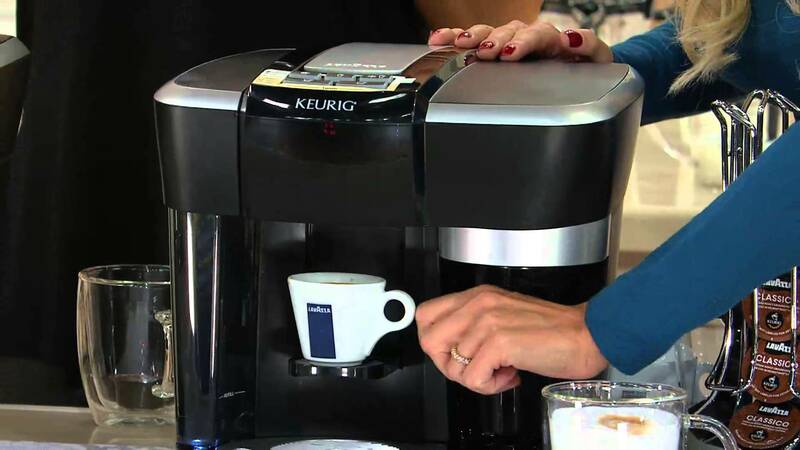 You will get the barista feel when using Keurig Rivo to make your coffee at home. The machine is also fast, you will not have to wait long for your coffee to get done. No matter if it’s your morning routine or your late night caffeine, the machine is always there for you. Keurig Rivo also comes with a frothing equipment, so not only coffee, you can make other coffee and milk based beverages. You can choose between three frothing types, which is hard to find in other similar machines. Those types including Cappuccino, Latte, and Cold Froth, so you can match the frothing to your beverage’s type. The frothing system will heat up the milk between 65 to 70 degrees Celsius depend on how much milk you put on the pitcher. Keurig Rivo can use many type of milk whether it is soy, skim milk, whole milk, rice milk, etc. To get the best result, you should use cold milk, because cold milk is the most receptive to frothing. When brewing coffee, the machine will heat the water until 75 to 80 degree Celsius, which is slightly lower than an average coffee. You can make two different coffee sizes; a short (1.4 oz.) or Lungo (2.8 oz.). Keurig Rivo can only use four types of pods; Classico, which is medium roast and have sweet floral and fruity notes; Delicato, which is medium roast and have chocolate as well as citrus mode; Intenso, which is dark roast and have full body as well as butter and caramel notes; and Decaf, which is medium roast and have smooth and have citrus as well as dried fruit notes. Starbucks Verismo is a coffee brewing system from the famous coffee company Starbucks. This company not only sells coffees in their shops, but also coffee systems. They currently based in Seattle, Washington DC. With this machine you can make your coffee as easy as pushing a button. This machine is perfect for those who want to simplify their coffee routine whether it is to energize your morning or to help you to stay awake at night when you still have works to do. Starbucks Verismo not only works really great, the outer appearance is also very modern and suitable with modern houses. It is also sleek enough measuring at 8” x 14” x 16”, so it will not take too much space in your kitchen counter. The body is using silver material to sandwich the black middle part from two sides. From afar the unit is somehow almost look like a CPU rather than a coffee machine. See also our article about Starbucks’s coffee products here. Starbucks Verismo is available in few series, but the one we are talking in this article is the 580 series. This machine comes with self-rinsing system and it will require you to rinse it five times before you can use it for the first time. The machine have three buttons at the front of the unit. The top button is used to rinse and you have to push it after inserting an espresso pods into the machine. The second button is the brewed coffee button and you have to push it to extract your coffee. The third button is the milk button and you have to push it after inserting a milk pod to create perfectly steamed 2% creamy milk. Starbucks Verismo powerful machine will heats up water quickly and serve your coffee only within 15 seconds. So you won’t have to wait too long to get your coffee done. The water tank on the machine is designed to be easy to remove, fill and then place again into the machine. You can remove and place it again by tilting the water tank outward after you fix the angle for the bottom portion first. One unfortunate thing in Starbucks Verismo is it only can be used with Starbucks pods. Even though the brand offer many blend options, soon you may get bored of them. 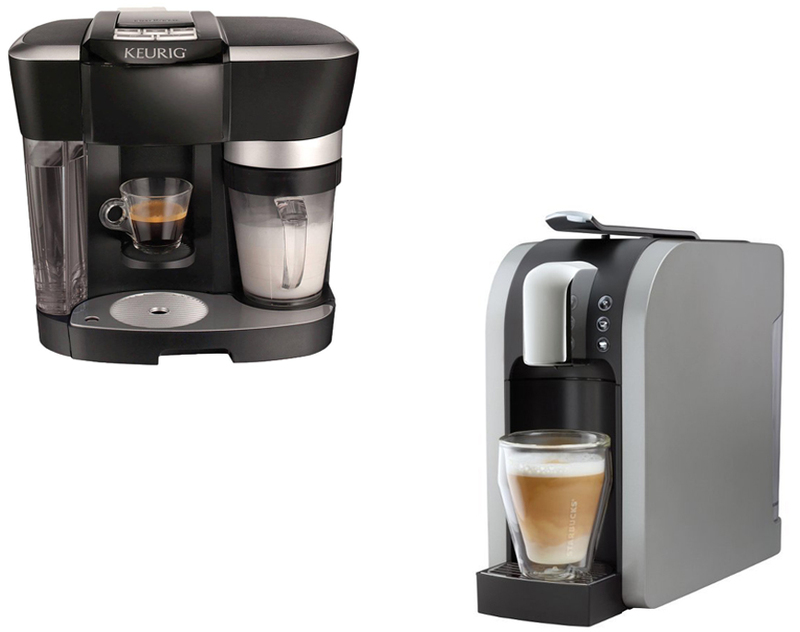 Now, let’s compare Keurig Rivo with Starbucks Verismo. Both machines is equally great for their fans, but if you look from their features you will instantly know that Keurig Rivo is better than Starbucks Verismo. From the milk frother side, you can use any kind of milk with Keurig Rivo, while your choice is limited with Verismo. Rivo also have frothing options to match your beverages. Rivo put its water beside the machine, which is an advantage if you place the machine in front of a wall. - Make some of your favorite Starbucks® coffee and espresso beverages at home. All from one machine. - Specially engineered pods keep the Starbucks® brewed coffee, espresso or milk freshly packed until the moment you use them. - High-pressure brewing system heats up and is ready to make Starbucks-quality beverages in less than 15 seconds. - Integrated rinse function helps keep machine clean. - Coffee cup depicted not included with purchase. All in all, the decision is all yours to make. However, in our opinion Keurig Rivo is better than its rival in features, moreover it also comes in more affordable price than Starbucks Verismo.